Still on halal food in Penang mode, why is this post in English where as the two earlier posts are in Malay? 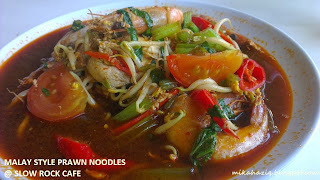 As usual, the reasons are because I want to monitor which language and keywords will lead to higher traffic and ad clicks and also because the first two posts on Penang Halal food are more relevant to the malays anyway, well the second one about the International Hotel Coffee House Nasi Padang Minang might be relevant to you if you like to eat Malaysian style rice and curry- the gist of that entry is that I highly recommend that place and you should come early as by 3pm there will only be leftovers. 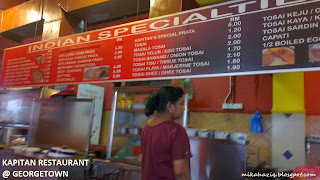 Now back to Kapitan Restaurant at no 93 Chulan Street, Penang. We headed to Kapitan Restaurant cos it was already 3pm and the Nasi Padang Minang was only left with a few dishes. Hubby tried it before when he went to Penang for training and said the naan is nice but the butter chicken is just ordinary. So, we parked somewhere at the road side (err. where else??) and dashed under the drizzling rain with our two sleeping kids in our arms.. (sigh.. the life of parents). 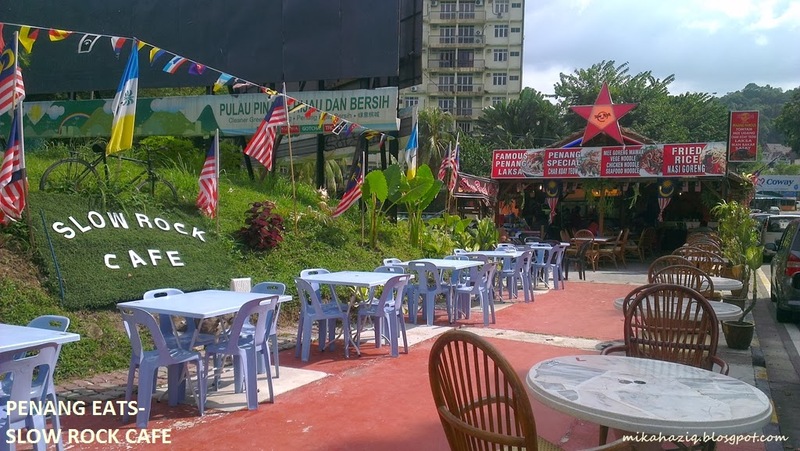 The place was still crowded at 3pm some table are empty but with dirty plates on the table and rubbish on the floor. We headed somewhere nearer to the front, so that it will be easier to call the staff. 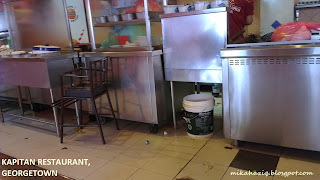 I stood at the side of an empty table with my sleeping son still in my arms so that the staff will pity me and come and clean the table and take our orders quickly. It worked like a charm haha..
We ordered 1 cheese naan set with tandoori chicken, 1 garlic naan set with tandoori chicken and teh tarik kurang manis (that's indian style tea with milk but less sweet). Took forever for the naan to come, hubby was quite fidgety, while I rationalised that the naan probably needs to be cooked longer in the oven :p The naan came *cold* and hubby gave me "the look". Oh-kay.. I get it.. that is his "I told you so" look and "you should have listened to me and start being your irritating self and pester the waiter for our food as u always do" look . Typical of him always being the good guy and letting me be the bad guy. I wasn't really that hungry, that explains my unusually strange, calm behaviour, the naan, cold as I mentioned, would have been delicious I guess, if it was served hot from the oven. 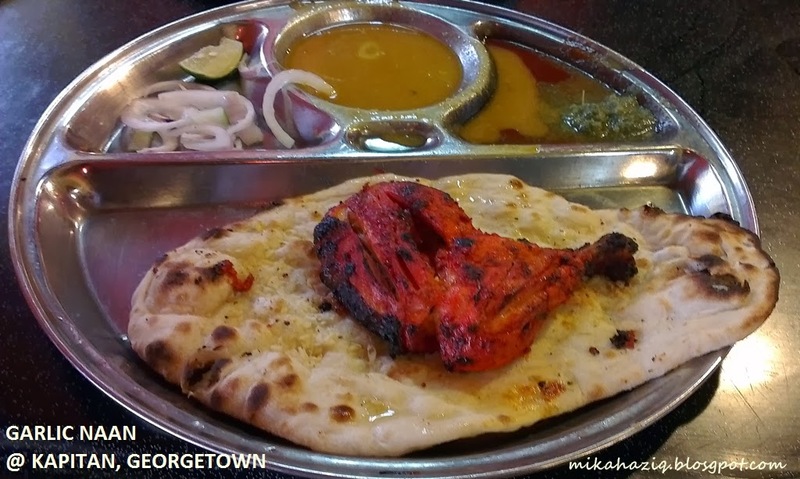 The tandoori chicken was quite tender but I don't quite get the accompaniment served with the naan, (As seen in the picture) I am assuming that the brown one is a very weak dhal, while the red one is a sweet chili sauce and the green one is a diluted mint chutney. I love the naan and the chicken, but the accompaniment is very disappointing. The teh tarik ( didn't snap a picture - very difficult with the sleeping kiddos) was still sweet even when we requested for a less sweet version. Most of the patrons were locals when we were there, but there was a table with two eurasian ladies. Maybe they were being adventurous. But, if you are looking to sample local eats in Penang for your holiday, be prepared to eat on a sticky table and put your feet on the not so clean floor here. Please don't come looking like you are regretting your decision. 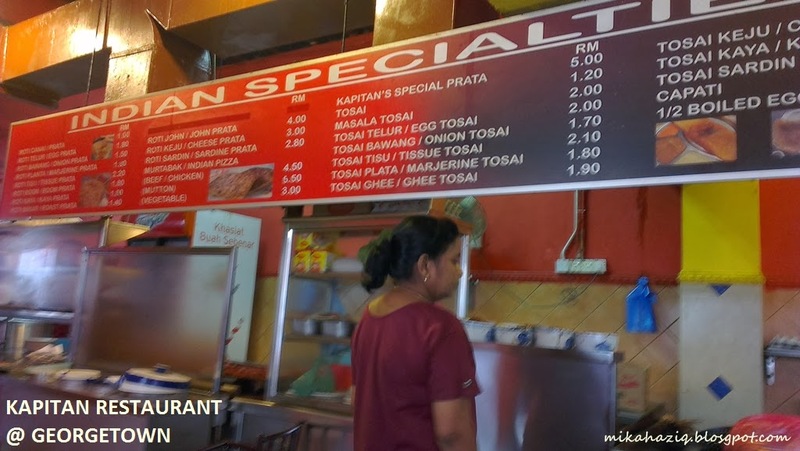 Seems like Kapitan Restaurant is also famous for its bryani, claypot bryani and nasi kandar, but we didn't try all those cos we were saving space for Adnan Ikan Bakar visit later in the evening. The review for Adnan Ikan Bakar is here though the post is in Malay. The next day, after a visit to Penang Toy Museum and Butterfly Farm with the kids, we were just looking for a place to eat near the hotel since the kids were sleeping, again! 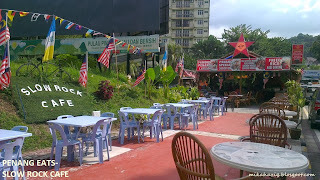 So, we parked opposite Hard Rock Cafe Hotel and ate at a small roadside cafe called "Slow Rock Cafe". We thought it was just a jibe at Hard Rock Cafe Hotel but turns out it is also because you can karaoke for free at the cafe if you are a patron. So we ate there while the owner belted out Hindustani songs at the background. We didn't really know what to order but since Malay Style Prawn Noodle is quite a famous dish in Penang, I thought I would just give it a try here. Hubby ordered Char Kway Teow (thinking that it is the chinese style) and wasn't really expecting the Malay- style char kway teow to be served (ok i feel a bit bad for not telling him beforehand but... sometime it's just best to let him discover things on his own without me butting in all the time haha) Hubby also ordered chicken satay. While we were eating, only locals came in to patronize the place. There were two eurasian guys who came in to have a look and then decided to leave. Yes, I would think there are more delicious non-halal options for you guys out there! The malay style prawn noodles was quite ok, not that I was expecting much, since this wasn't one of the recommended prawn noodle stalls. But, at RM12 I find it a bit on the high side even though the serving was very generous with the prawns. 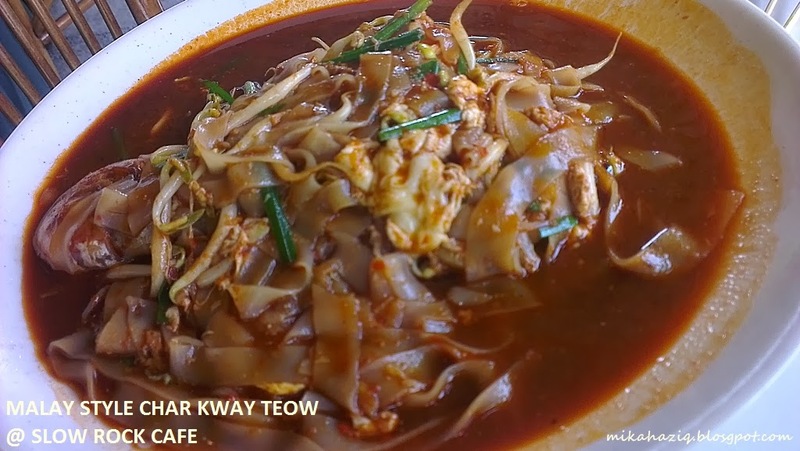 Hubby, on the other hand, found his Char Kway Teow a bit soggy and preferred my prawn noodles. The chicken satay that we ordered was not quite satay, I would say it's more like chicken kebab and a plain one at that. The peanut sauce? 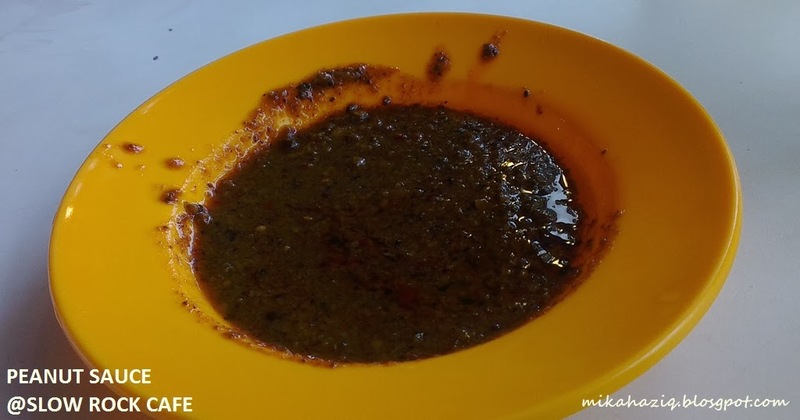 Not representative of the usual peanut sauce. I am not too sure, maybe this is a version of satay that I am not familiar with. Just like how Minang Satay is different from Malaysia / Singapore satay this might be a different kind of satay that I have not tasted before. Overall, don't expect much from this cafe. Service is also quite slow. So don't come ravenous.